We could look back at the state of the smart clothing industry this year, last year and the year before that and say a similar thing; we're still waiting for it to go mainstream. In 2017 so far the big announcements have come from Polar with its Team Pro smart shirt that's firmly designed with professional sports teams in mind. Then there is of course Project Jacquard and Google's collaboration with Levi's on a smart denim jacket that's aimed at commuting cyclists. Both offer very different kinds of smarts, but do share some worrying similarities. They are expensive and still feel very niche. Playertek is a company that this year launched a £199 smart compression crop top for sports teams and individual players of all levels to monitor a host of insightful game metrics. It has a clear vision on how it wants to bring connected clothing to the masses. "We are not trying to make something new", Playertek co-founder Kevin McDaid told us. "We are taking technology that's already being used and bringing it to everyone". That technology is the kind we've already seen fitted into wearables such as accelerometers that sample data in three directions and GPS to map movements. That's packaged into a tracking pod that sits in the back of its compression top - that could well have been a long sleeve vest according to McDaid - and is placed higher up the body to accurately reflect the natural movement of the body. "If you wear a Fitbit or an Apple Watch that only measures your movement every one second. In a football game, you can get up to speeds up to 8 m/s and in two seconds you can do 16 metres. If you are only sampling your position every second or every two seconds then you are not going to accurately measure your speeds or your change in movement and ultimately your distances"
Last year Playertek was bought by Catapult Sports, the Australian company that has been offering similar technology for elite teams from the English Premier League to the NFL for the past 10 years. Now the two are seizing the opportunity to bring the tech and sports science that underpins it to every single player to help improve their game. The smart vest has been available for a few months now and while there's no talk of numbers, McDaid says the feedback has been positive and tells us the company has struck the right balance of metrics and tactical analysis that players and teams of all abilities can benefit from in training and in matches. So why does Playertek's smart clothing solution have a better chance of success than other examples we've seen in the past? McDaid believes there is an obvious answer to that. "The difference between us and the likes of Fitbit is that people who buy a Fitbit do no exercise or they stop doing exercise", he explained. "We don't need more people to play football, there's already a whole load of people doing it. We don't need to encourage them to do more exercise. "The smart clothing market is there but it's all about the story of taking your data and player data. For me it was a no brainer to want to bring this technology to more people to understand what was happening on the football field. We are just trying to shine a light on something a lot of people already do." Despite all the expertise at Playertek's disposal on monitoring player performance, telling that story has not been straightforward and has come with its challenges. "The difficulty was trying to simplify the message and the features," he told us. "At the elite level there's literally 100 different metrics and as the product develops we will add more metrics to make it more sophisticated. But right now, we think we have the the right metrics and tactical insights." Those metrics right now focus on elements such as distance covered, sprint distance, sprints completed and distance covered. There's a big emphasis on positional movement, how hard you've been working and how regularly you've been doing it in the game. McDaid suggests it's not done yet with the metrics that could be on offer. "We are looking at letting players see how hard they've worked from one week to the next and whether overdoing it one week means you are more likely to get injured," he said. "That kind of analysis could be really insightful. If you are doing a training session that covers 7km before a game, you are not going to be at you optimal game the next day. In the next 6-8 months we have a lot of exciting things coming up and it's going to be on the lines of telling a better story of what the players are doing in training." 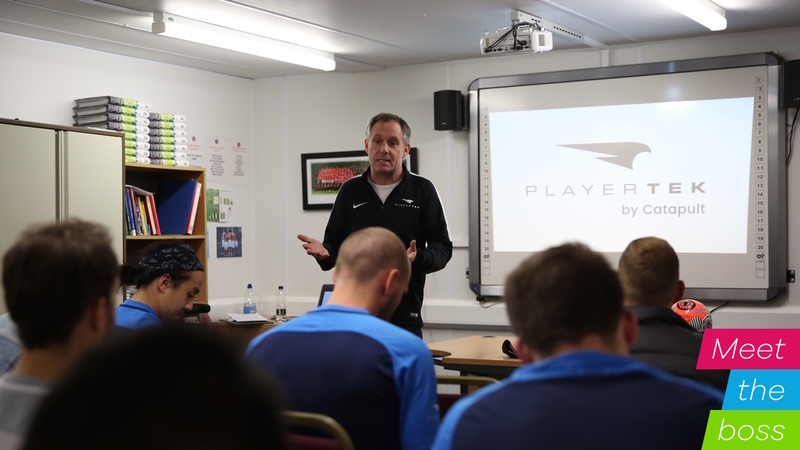 Away from coaches and players being able to keep a closer eye on their performances match by match and over a season there is the potential that Playertek's tech could play a part in uncovering players that are not already picked up by academies and could evolve into a useful scouting tool for clubs. "We already have colleges in the US for example taking advantage of it to monitor players," he told us. "Say you're looking at a typical 15 or 16-year old game and you have a player that looks great against really poor opposition. If they are wearing something like our Playertek smart vest, you can get a much better idea of the story of their game and their contribution. "There's a huge amount of data we have in our system. We don't publish these data sets, but it's very interesting to see what teams and players are doing in training. We can learn from that and analyse individuals bearing in mind what we know about what their teams are doing." What is clear is that Playertek has a strong vision of what it wants to achieve with its smart garment and it's honing in on what users really want: "People want more detailed tactical analysis and being able to compare with professionals and that's what we are aiming to deliver over the coming months and years."